My favorite parts of the world are similar to Scotland - Iceland, Norway, Patagonia - but add in a group of friends you've known for 30 years, incredible beer, beautiful weather, endless nature and a killer hotel and a weekend in Scotland just became one of the most epic trips of the year. 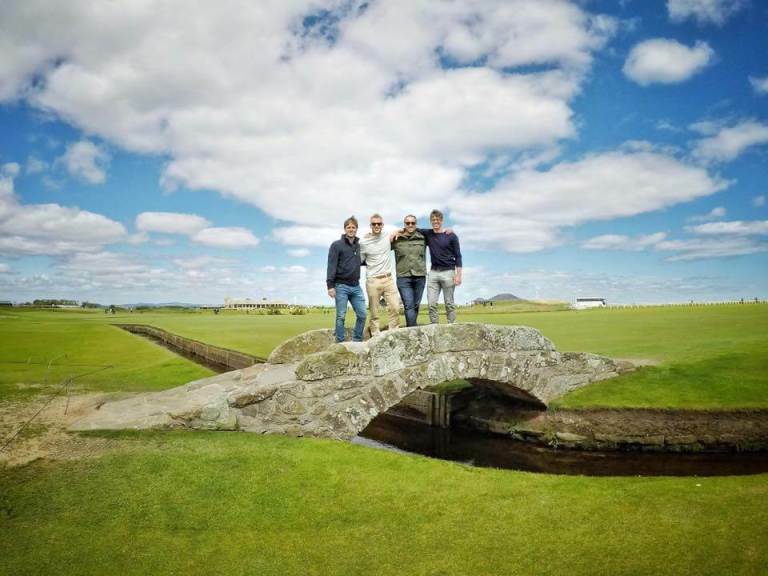 Scotland has been on my bucket list for years, so I was thrilled to be able to meet friends I've known since I was a baby in Edinburgh for a guys weekend in Scotland. Thankfully we picked the perfect weekend in July as the weather couldn't have been better and we enjoyed 3 of 4 days without a single cloud or drop of rain. As with all of our trips, the first thing I did was look for a Radisson Blu, and wouldn't you know it, right smack dab in the middle of the Royal Mile we found the Radisson Blu Edinburgh, in a super epic building just steps from every bit of nightlife, ale and delicious food we could ever dream of. When only exploring a city for a weekend, location is key. Basing ourselves on the Royal Mile in Edinburgh gave us the perfect location to explore from and if you've come for a relaxing weekend in Scotland full of good food and drink, you could not have come to a better place. Endless local pubs line the cobblestone streets with authentic live music filling the air whenever you walk by. The first thing you'll notice strolling the Royal Mile is the very impressive Edinburgh Castle looming over the whole area, which is easily the most impressive castles I have ever visited. Don't be tempted by all of the amazing pubs and restaurants that line the streets and make sure to make your way to the gates and get inside. Arrive early to avoid long lines and crowds. Inside is one of the largest and most well preserved castle complexes imaginable, ready for hours of exploring. Whether you like weapons, weaving, dungeons, art, architecture or religion, there is something for everyone inside the castle walls. And remember, if you are there any day except Sunday, the huge canon goes off at 1pm daily and is quite impressive. 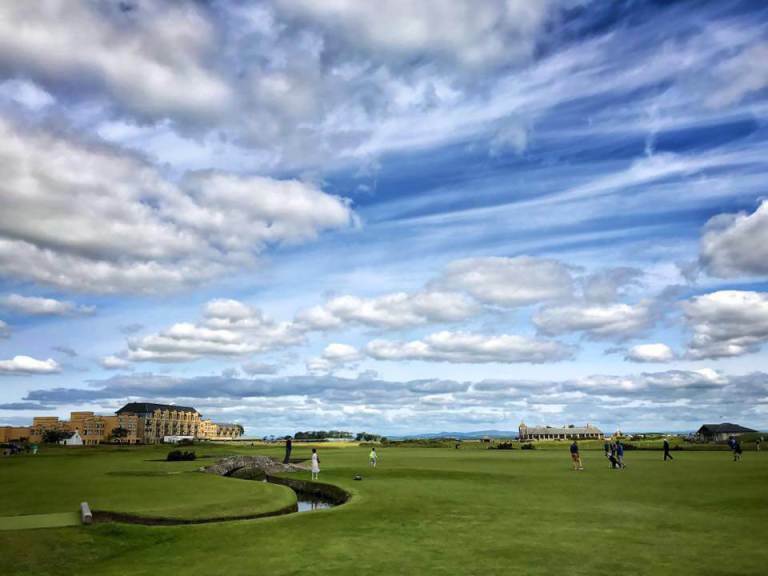 If you can tear yourself away from the charming downtown of Edinburgh, we highly suggest renting a car and heading off to the Scottish Highlands for a beautiful day drive. Scotland is one of the greenest countries on Earth, and especially coming from Dubai, it is amazing to get out in the nature with endless flowery fields, ancient woods and hiking trails and paths at every turn. 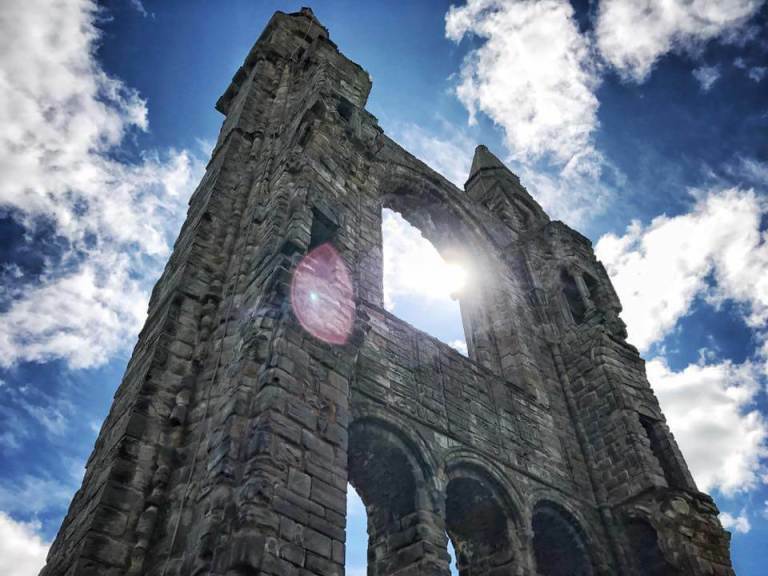 We first jumped int he car and headed up to St. Andrew's to visit the world famous golf course and of course the ruins of the old cathedral, which look like the are straight out of a movie set. The entire town of St. Andrew's is charming, inviting and extremely picturesque but we had to leave and continue on our journey. We headed next to the small village of Dunkeld, just at the start of the Scottish highlands along the banks of the River Tay. While almost impossible to pass by the river side beer gardens and outdoor restaurants, we walked over the bridge to the start of the hiking trail which leads to endless hikes of various sizes and shapes just along the river and up into the neighboring hills. We chose a short 6km loop through the old woods, including the last remaining trees used as inspiration for Shakespeare's "Macbeth", and spent a great afternoon getting lost in some of the most green and vibrant forest we've seen. Heading back to the village of Dunkeld we spent the late afternoon sitting on the banks of the River Tay enjoying local seafood and great beer - what more could you want in an afternoon? Heading back to Edinburgh, we quickly changed at the hotel and grabbed a delicious whiskey at the Itchycoo Bar and headed out to a steak dinner at the Rib Aye, where we had an absolute feast of delicious cuts of beef with regional specialties like grilled pigeon and of course haggis - and enough whiskey to kill a sailor. Waddling out of the restaurant we headed back to the Old Town and did a little bar hopping, jumping in and out of all variety of bars and clubs, some playing classic Scottish folk music and some, playing only the best 80's and 90's songs. The opportunities are quite endless when you are stationed on the Royal Mile, walk any direction and you're sure to find a place that suits your fancy. Waking up the next morning we had our first spot of rain, so we looked to see what was close by and the National Museum of Scotland was just around the corner so we popped in for a visit and were quite surprised at the vastness of the museum. If you've got a couple of free hours or the weather is crappy, you could do a lot worse than to get lost in here for a couple hours. And finally, if you are looking for a couple of delicious places to eat (we'll leave the Scottish pubs off because there are so many and they are all amazing), we recommend Thai Orchid, right by the gates of the Edinburgh Castle and No. 1 Sushi Bar, just a couple km away from the Royal Mile. Both are delicious, fairly priced and friendly. Final notes - if you are looking to get into the city from the airport for cheap, there is an airport bus that goes direct from the airport to the city center for about 4 euros each way. Also taxis and Uber are everywhere. 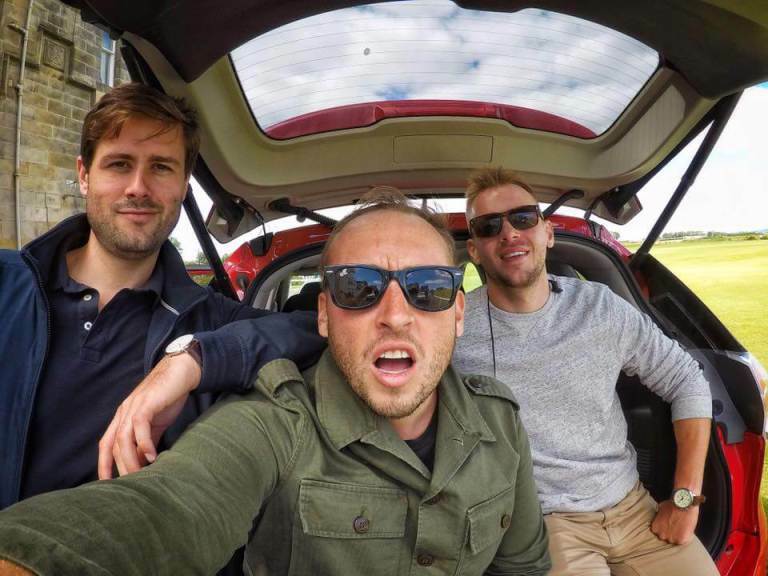 Our ultimate guys weekend in Scotland could not have been better and only left us all wanting to stay longer and explore, which is just what we'll have to do on another trip. There are endless road trips to take from the city center that can be done in a day, as well as exploring the entire Whiskey Trail of world famous distilleries and of course visiting Loch Ness, all which will be done on our next weekend in Scotland. 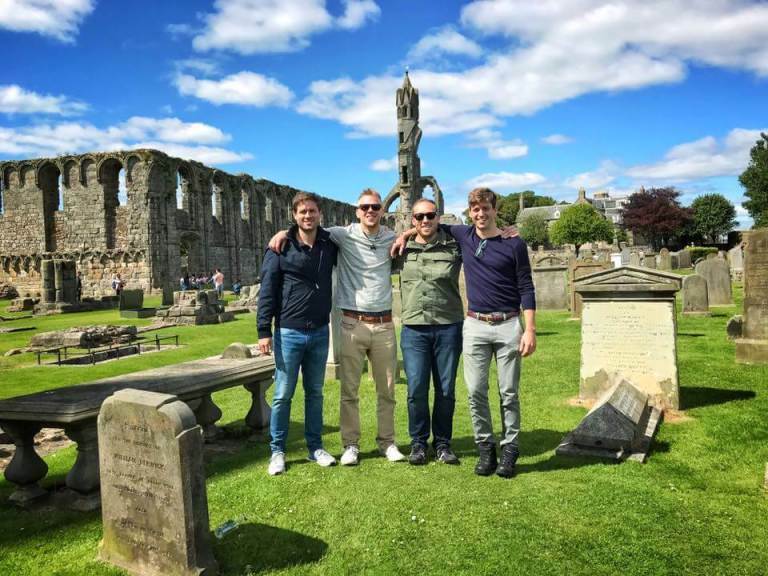 Scotland is a beautiful country, a rugged country and a friendly country and somewhere I am so happy I was able to explore with guys I've known my whole life. While I cannot imagine we'll have the same amazing weather on future trips, I cannot wait to get back and explore more, and hope for longer than a weekend in Scotland the next time we visit.